Fill in your starting point and and click onto the submit (>>) button. 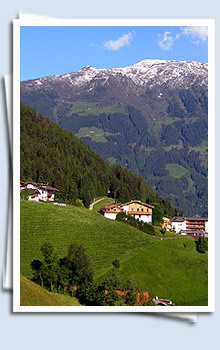 Take the Inntalautobahn (A12) exit "Zillertal" and follow the Zillertal-Bundesstraße (B 169) for about 25km. Leave the B 169 at the exit "Zell am Ziller Mitte" and follow the Gerlos-Bundesstraße (B 165) in the direction "Hainzenberg - Gerlospass". After about 4km you pass the ski lift station "Gerlossteinbahn". Continue for about 200m until you reach the restaurant / hotel "Jörglerhof". There take the access road on the left. Our house lies on the end of that road (about 40 meters). Take the train to Jenbach (express train station) and change to the Zillertalbahn (railway/bus) for Zell am Ziller. Then, either take a bus or call a taxi to Hainzenberg.